Introduction to the "Doctrine of Balaam"
what Balaam did and said in rebellion against God. of God in the Bible as those of whom leadership they accepted. might call it a “Moment of Balaam Sanity”. 1. He could not hedge on God if paid a whole house of silver and gold. 2. Balaam refused to go beyond the Word of God in rebellion and fables. out of the Bible--rather than isogesis, to read meaning into the Bible. Bible as the Word of God to do less or more? later in the joint Bible studies on Balaam and Christian Fables. Christians a conviction that we are now in the Falling Away. common, the overwhelming desire for big pay and big personal gain. commandment from leaders not to marry and to abstain from good meats. covered in Acts 19, verified by the Apostles Peter, Paul, and James. Balaam than we realize until we cast our mental tents on the subject. would advance Christian fables for pay and personal gain. (1) Progress chart on the “Christian Fables” Bible sessions at www. (2). Progress chart on Balaam at www.biblecombibleman. recorded in Numbers, chapters 22 and 31. Balaam to curse the children of Israel. the soothsayer before Moses gave to Reuben his inheritance in the land. 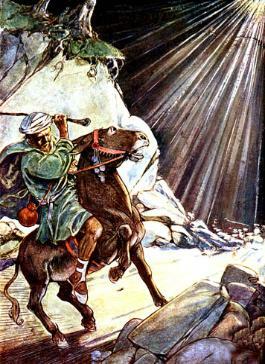 forcing Balaam to bless Israel by delivering them out of Balak’s hand. then either save it to your computer or view it.